I’m FIIINNAALLY getting back to this topic on my blog! 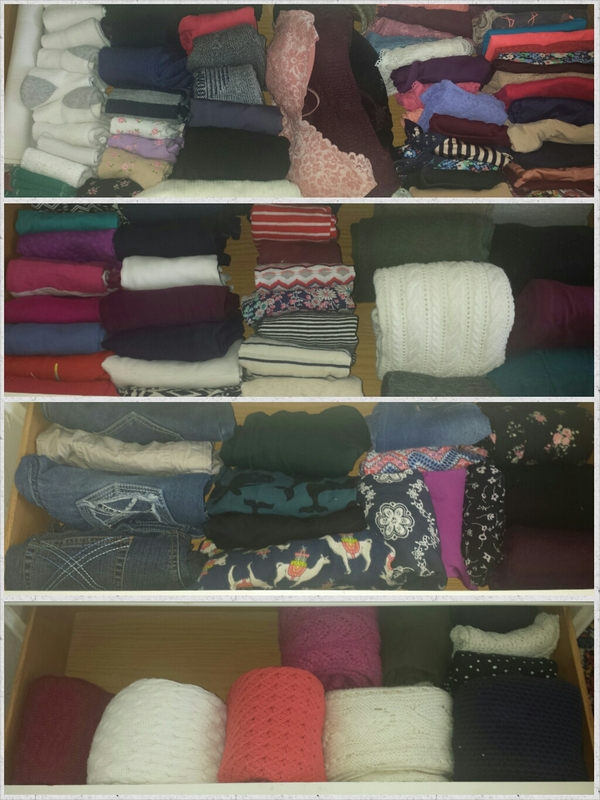 For those unfamiliar, earlier this year I was introduced to the KonMari tidying process and began blogging about it. Due to some serious life changes, much of my tidying process, and especially blogging about it, has slowed to a crawl. This post has been in my drafts folder for months, so I’m happy it’s finally seeing the light of day! The KonMari method of decluttering puts clothing as the first category to go through. This is because clothing is generally the easiest category to know whether or not it brings you joy. I’ve discovered that most of my dejunking marathons through the years begin with clothes. I had already gone through my clothing, as well as the children’s, a month or so before I discovered the KonMari method. I didn’t think I really had anything left to discard. The biggest deciding factor in determining what clothes to keep (and many other things) hinged upon whether or not I would have more children. For years, I’ve kept clothing in several sizes, including maternity, because my size fluctuates so much through pregnancy and post-partum. I’ve had several bins of clothing, and it was honestly annoying to store that many clothes, most only worn for a very short duration of time. Not to mention, all the kids clothing I’ve kept for any future children. There were sooooo many bins of things all related to child-bearing! I had been on the fence for a year about having more children, feeling like I really should stop. I was quite convinced it was time to say goodbye to my baby years, but my heart was very sad about it. However, I finally decided it was time to move on with the rest of my life, and to help strengthen my decision and make it really permanent, I got rid of all the clothes that don’t fit me. I tried to find good homes for my nice maternity pieces, and started discarding lots of baby stuff. I was working on creating a new life, and wanted my possessions to support me in that process. This was a depressing process. I loved the downsizing aspect, but felt confused and depressed about what that represented: No more children. As it happens, I’m very excited to be expecting another baby. I didn’t think I would be, since I was so adamant that chapter of my life was over. But the internal struggle I had in simply parting with all the baby stuff simply revealed that I just wasn’t done… not yet. So the disappointing news is that I barely had any maternity clothes and no large post-partum clothes left. However, this means I get to pick out new clothes, and that can be exciting. The funny thing about storing all those clothes is that, inevitably, with each pregnancy and post-partum period, I’ve always ended up buying new clothes. The old ones either wore out, no longer fit correctly, or simply didn’t appeal to me anymore. I’d end up getting rid of the old clothes and filling the bins with the new clothes, only to get rid of those and buy news ones next time around. Yes, there are a few pieces I wore again, but very few. (Thankfully I still have the two pairs of maternity jeans I paid nearly full-price for years ago, as well as the expensive nursing dress and nursing hoodie.) So, basically, I always end up starting over, so there was little need to store most of those clothes. Now that I’m not storing all those old clothes, I have more space and can think with a fresher brain about what I’ll want/need as this pregnancy progresses. I’m gaining a better idea as to what clothes truly bring me joy, and it’s helping me in choosing pieces that I’ll actually wear and that make me feel good. I’m being very thoughtful about my purchases and hoping I can squeeze through this next season without accumulating too many clothes that I most likely won’t wear again. I’ve been fortunate to receive maternity clothes from my friend and I’ve only had to buy 3 pieces of clothing so far that should also work post-partum. I’ve been avoiding buying strictly maternity clothes, intentionally finding versatile clothing for breastfeeding and after. So now, enough with the maternity talk. Let’s get back to the KonMari method! After I ordered Marie Kondo’s books, and before they arrived, I decided to go ahead and try out her method of folding clothes that I had seen illustrations and videos of. In particular, my lingerie and sweater drawers were a mess. While I was skeptical this folding method would offer more space, or that I would even keep up with what seemed like a complicated folding ritual, I decided I had nothing to lose. I dumped out the contents of my lingerie drawer on the bedroom floor and started organizing the items into their categories: underwear, bralettes, socks, etc. During the process, I got rid of some items, but not very much. I sat on the floor and folded all my items, and actually giggled at how cute they looked, tiny little rectangles standing upright in lines. When I put everything back in the drawer, I was amazed! There was space for everything! I could see everything in one shot. It looked so organized and… joyful! I tackled the next drawer down, which is my shirts. I did the same process and was again amazed at how much space I had! I also did my pants drawer the same way. I was so excited! Before, my drawers were so hard to keep organized or fit everything into, but now everything fit so well and I could see all my clothes in one shot! I didn’t have to rumage through piles to see what I owned, it was all right in front of me! I finally got to the bottom drawer, which is my sweater drawer. Because I could never figure out how to fit the sweaters in there, I honestly just shoved them in. It was just a mess and I could barely fit everything. 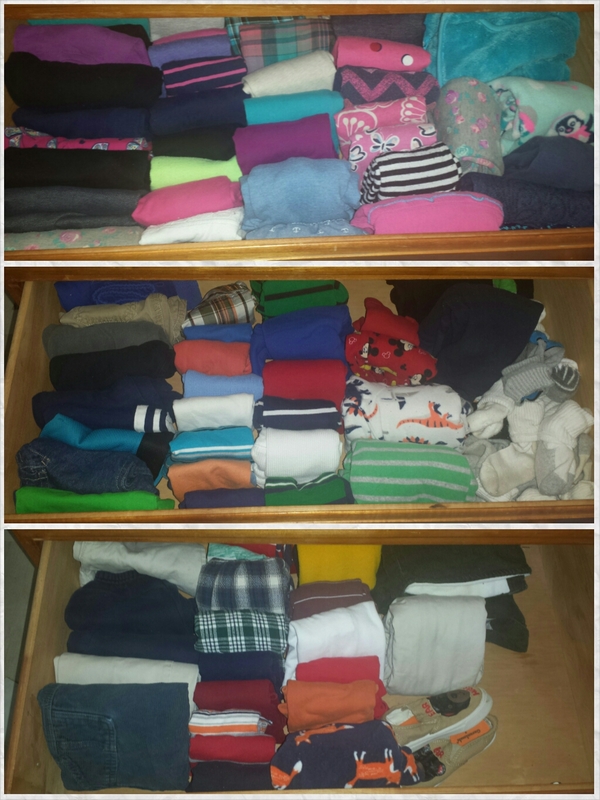 I did the folding method, and although it’s more difficult with sweaters (mine end up more like rolls instead of rectangles), I managed to neatly fit all of them in the drawer! Such sweet relief! Now, this was all well and good… but could I actually keep up with this folding method? It’s been several months and sure enough, my drawers are still neat and organized. I have not relapsed into chaos. Folding the laundry now takes a little extra time, but I almost enjoy folding clothes now. It turns laundry into a fun puzzle of pieces that fit together. When I know the outcome is organized, happy drawers, the extra effort is absolutely worth it. I used to HATE putting away laundry. I was terrible about putting clothes back into my dresser because it somehow became so messy so fast. I constantly had to restack my clothes to make things fit, and it was always a grumpy affair. But now I love getting all my clothes folded neatly in my drawers. This was amazing. And I wondered… Could I do this with the children’s clothes too? Again, I was skeptical. Their clothes are so tiny, and what’s going to keep my 4 year old from making a mess of her drawers like she always does when she’s deciding what to wear? Turns out this folding method is GREAT for the kid’s clothes! It resolves all the same problems. Because my daughter can now see all of her clothes without rummaging through them, she can easily select what she wants, pick it out, and the rest of the clothes remain neatly folded in their upright positions. The children’s clothes. The bottom drawer is filled with the next size up for my toddler. As he grows it’s so easy to pull something out from this drawer to fit him. The one disadvantage to using this folding method for my daughter’s clothes is that she’s CONSTANTLY changing her clothes and there’s always clean clothes strewn about the floor. Until I can train her out of this normal childish habit (is this mostly a girl thing? ), I have to refold and put away the clothes. This folding method takes more time, and so tidying up her room takes more time and effort than normal. However, the fact that whatever she leaves in the drawers are still neat and tidy makes putting away the clothes easier. I recently went through the few baby clothes I had in storage, and using this folding method made a huge difference. Before, the clothes were just shoved into bags into storage bins. Folding the clothes into upright rectangles allowed me to fit everything into one bin, whereas before it was in at least two. 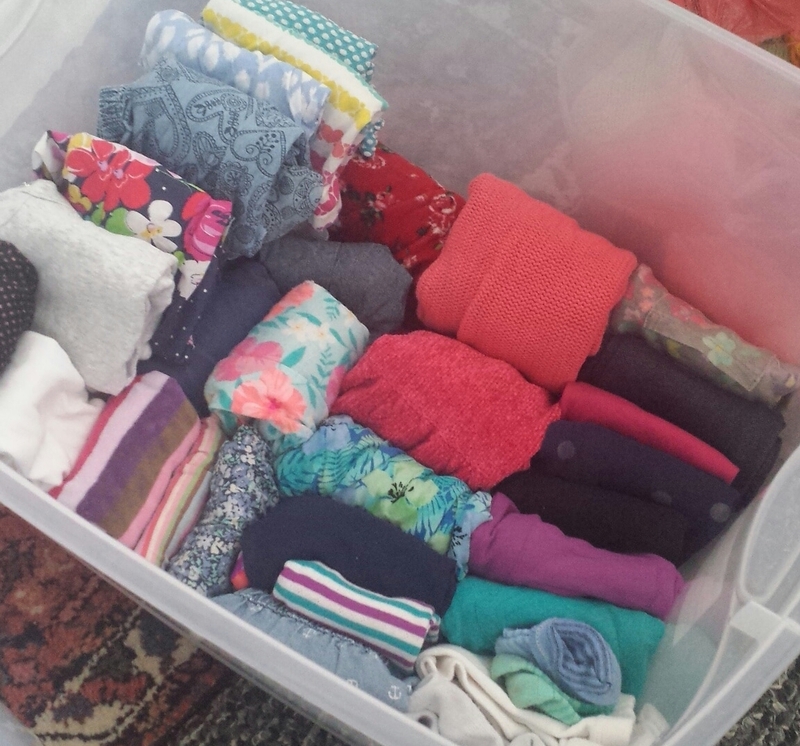 Folding the baby/children’s clothes the KonMari way for compact storage. Once we get some other major projects done, my plan is to turn our “guest room” (more like storage room!) into the family closet. We don’t have any closets, but we do have a wardrobe in this room. I’m planning to set up most of our dressers in this room (right now they are scattered in different rooms), and get an extra dresser to put all our “storage” clothes into. This includes off-season clothing, and bigger/smaller sized clothes for me and the children for when we change sizes. This makes everything easily accessible for whenever we need it, and helps us stay aware of exactly what we own. As a bonus, dressers are far more attractive than stacks of rubber storage bins! Also, having a central location for our clothes will make putting away laundry much easier- and I won’t trip over toys trying to put the kids’ clothes away! 2. You never know when you’re going to need some warmer clothes. Keeping off-season clothes in a dresser that’s easily accessible all year eliminates the hassle of storage bins and its always easy to see/remember just what we own. Sometimes things in storage remain a mystery and takes major excavation to discover! I wish I could say I’m done with the entire clothing category, but my husband has yet to go through his clothes! And it turns out… he has a LOT of clothes. I keep pulling more bins out of storage and wonder if there’s still more hiding somewhere! No doubt much of the clothing is too small now and hopefully we’ll be able to seriously reduce the amount he owns. I was seriously enthusiastic about starting the KonMari tidying process so I made sure to grab all of the clothing we own out of storage. However, my husband has a lot of other priorities and so we haven’t been able to go through his clothing yet. And so my home has various bins of his clothing hanging around everywhere, haha. It’s important not to bug him about it or go through his clothing without him. KonMari stresses that if you can’t get your family members on board with the process, then you need to keep focusing on your own possessions. And so that’s what I’ve been doing. Hopefully this winter when things slow down some, my husband and I will have the time to go through his clothes and our joint possessions. I look forward to getting our family closet set up this autumn. I will definitely post about it when I get it done! This was very interesting. Clothing is the one clutter in my house I don’t know how to fix. I have all the same problems you did. Too many unusable maternity/large clothes, bags and bags of baby/toddler clothes… and our clothes seem to always be everywhere because we are always trying to find something.